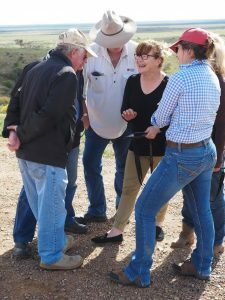 Jamy Somerville from DPI Emergency Services shares a joke with biosecurity staff during field training in electronic locust reporting near Mundy Mundy Plain. PLAGUE locust inspections have gone digital in western New South Wales, with the advent of a new iPad-based reporting system for use in the paddock. “While the excellent season is good news for landholders, it also provides the food source for locusts to start building their populations as the weather warms up. “To reduce the impact of locusts over this period it is vital to monitor the landscape for signs of activity, and where necessary to report signs of egg hatching or hoppers that are forming into bands,” he said. Mr Creeper said recording this information is going to be easier this year as Local Land Services Western Region and the Australian Plague locust Commission will be using iPads to record infestations in the field. “The NSW DPI (Department of Primary Industries) has developed special new software to streamline the process of recording information about infestations and sharing that with agencies across the state,” Mr Creeper said. Local Land Services and Australian Plague Locust Commission staff received training in the new technology from NSW DPI Emergency Services at a training day held in Broken Hill. MrCreeper believes the new technology will speed up the process of recording and sharing information about plague locust activity, and that should result in a quicker and better coordinated response aimed at reducing the damage locusts can cause before they’re brought under control. NSW farmers who you locusts should contact their nearest Local Land Services office.